Holiday closure schedule: For Passover the building will be closed on Sat/Sun- 4/20, 4/21 and on 4/25, 4/26, 4/27 except for religious services. Scroll down for contact info and answers to frequently asked questions. 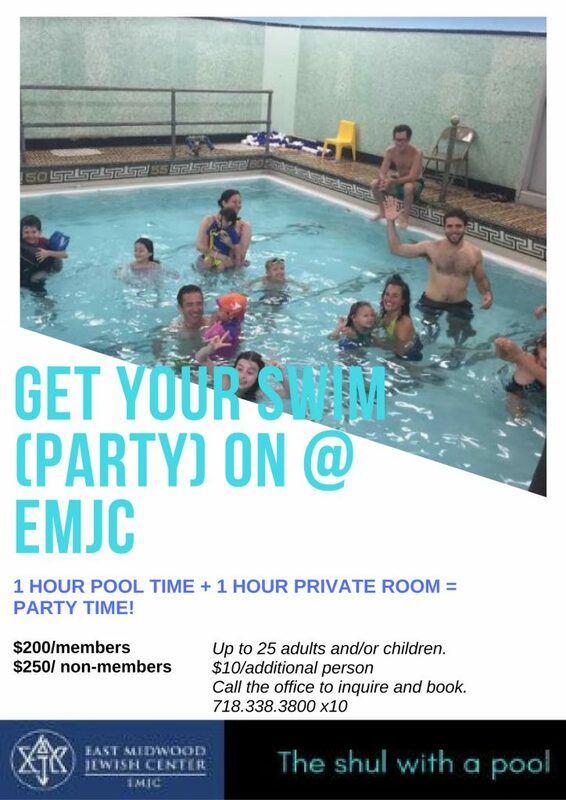 SWIMMING IS FREE FOR EAST MIDWOOD JEWISH CENTER MEMBERS. Monthly Passes: $60 for Individuals. $90 for Family (parents & 1-2 children; each additional child $12 extra). For first-time monthly pass purchasers, bring photo ID. (Passes can be renewed & are by calendar month only, such as Feb. 1-28, Mar. 1-31, etc.) Payment must be made upon arrival in the building lobby or office. POOL RULES: All swimmers must wear bathing caps and flip flops. No street shoes allowed. No outside pool toys allowed. Payment to East Midwood Jewish Center: Can be accepted by cash, check or credit card (for women, men, co-ed and family swim). Classes: Payment, registration and questions about classes should be coordinated through the above contact info (class and lesson contact info). All the above classes and lessons use our pool (some at times scheduled above, others by appointment), but please contact them directly to sign up. 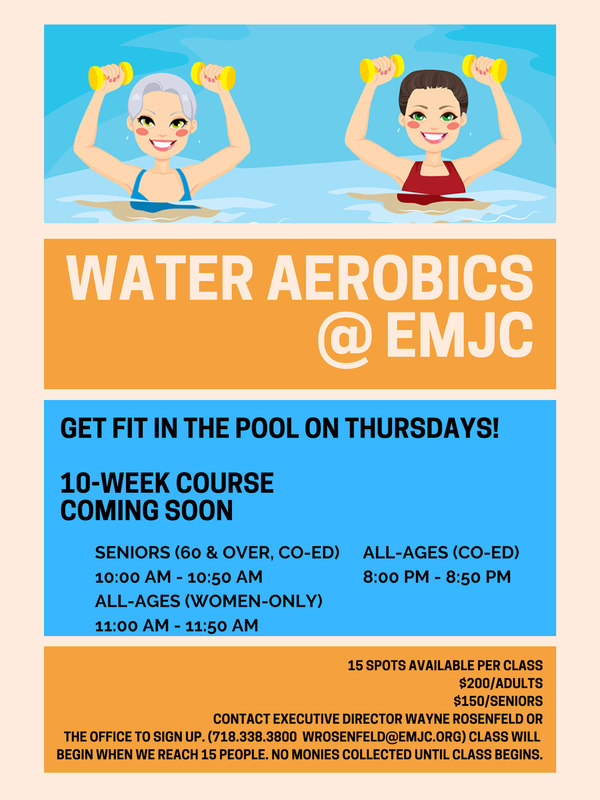 Updates: By the beginning of every month, our updated pool schedule is posted at emjc.org, in our lobby and emailed to our swimmers’ email list contact info@emjc.org to join the email list). When unforeseen circumstances (such as maintenance) come up, we email our swimmers list and post signage to notify pool users. Lifeguard is on duty at above times. We have locker rooms with showers for men & women (but bring your own lock if you’d like to lock your locker).